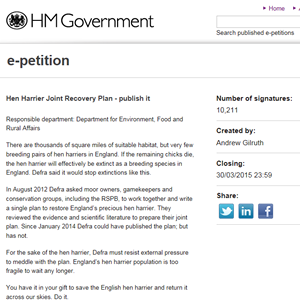 We're pleased to announce that the petition calling for Defra to publish the Hen Harrier Joint Recovery Plan has passed the 10,000 signatures mark. This means that Defra are now obliged to respond to us in writing. The petition was launched at the recent CLA Game Fair meaning it took only 49 days for it to gain the required 10,000 signatures. We would like to take this opportunity to thank everyone who has signed the petition and supported it by spreading the word. Without your help we would not have been able to get to 10,000 so quickly. We'll have more news for you on this subject as soon as it breaks so please sign up for our FREE newsletter to ensure you don't miss out.